If beauty is in the eye of the beholder, than anyone who is not drawn into Mad Enchantment: Claude Monet and the Painting of the Water Lilies by Ross King is truly visually impaired. While the title places specific focus on Monet’s famous painting, the book is rich with details about the artist’s life and his relationships with family, friends, politicians, and other artists. In spite of achieving wealth and fame, Monet’s life was not without sorrow. Married twice, his first wife, Camille, died in 1879; his beloved son, Jean, suffered a stroke in 1912 and died in 1914. His second wife, Alice (with whom he had an affair prior to Camille’s death), previously married and with six children of her own, died in 1911 of leukemia. Monet’s birth and youth are not the emphasis of the book, but King peppers the chapters with anecdotes about Monet’s youth, his travels around France, “palette and paintbrush in hand.” Monet’s journeys away from France to other countries such as Norway and England give depth to King’s development of Monet not only a master artist, but as a character of many impulses and sensitivities. King opens describing the friendship between Monet and Clemenceau, fondly referred to as “The Hedgehog and the Tiger,” respectively. Clemenceau was a frequent visitor to Giverny and Monet’s home with its vast gardens and infamous water lily pond, and he was instrumental in keeping Monet driven to complete his visions. Early in the 20th century, Monet’s garden paintings proved both “critically and commercially successful,” and in 1909 that success skyrocketed when he displayed 48 of them at an exhibition in Paris. Other critics were perhaps less verbose with their criticism, yet nonetheless insulting with their almost waggish slights as King put it, “anyone who thought Impressionism a pleasant recreation involving little more than setting up an easel beside a river on a sunny afternoon and slopping bright colors onto a canvas . . .” As degrading as these comments might have been about the Impressionist movement, they were especially hurtful to Monet, yet his friends rallied, contradicting the critics while expressing the depth of Monet’s work. 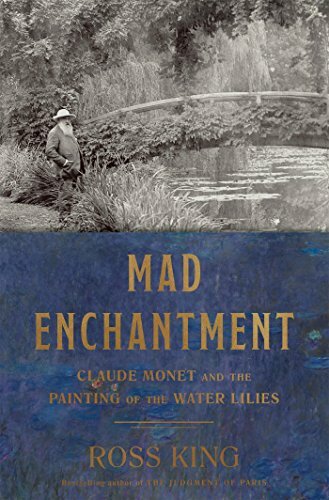 While the book covers the heights and depths of Monet’s work over several decades, in the second half of the book King brings the point back to “Monet’s obsession with water lilies,” which began in 1889 at the Exposition Universelle. These flowers held an important place in various cultures from Indian to Aztec, from North Africa to Mesoamerica, as well as to religions such as Buddhist mythology, and ancient Egypt and Rome. The description of the characteristics of water lilies is further explained as flowers that are “Anchored in the mud, their beautiful blossoms floating on stagnant waters—such characteristics were bound to attract symbolic meanings.” Several of Monet’s friends found this symbolism in Monet’s garden fodder for their imaginations. Political situations, especially the onset of The Great War, had a strong impact on Monet. As he remained steadfast in Girveny, declaring, “‘. . . I shall stay here regardless, and if those barbarians wish to kill me, I shall die among my canvases, in front of my life’s work . . .’” many of France’s most talented artists took up the mantle and left for war. Monet had experienced periodical vision problems since 1912 but the problems remained under control for nearly a decade. By 1922 his eyesight had “become so impossibly dim that he finally overcame his trepidations about an operation.” Cataract surgery was performed on both eyes, and initially he saw vivid colors, but the sensation did not last. After almost a year, and several operations, Monet’s vision improved, and he returned to his easels. King brings the book around full circle having started with Monet and Clemenceau and ending with them. On December 5, 1926, Claude Monet died, surrounded by his collection of paintings by the likes of Manet, Degas, Pissarro, Renoir, and Cezanne; he was as well surrounded by those who loved him most: his son Michel, stepdaughter Blanche, and the incomparable Georges Clemenceau. The critics remained diligent with their disparaging remarks while his staunch supporters kept his reputation alive and well in the years following his death. Mad Enchantment is a book to be read and enjoyed; it is a learning experience for those both learned and inexperienced in the world of art. Ross King does an exemplary job of bringing Claude Monet back to life. This one belongs on the bookshelf within easy reach.